Frances (known as Fanny) Davenport is my third great-grandmother. A couple of years after the death of her first husband, Leonard Adsit, Fanny (with five surviving children) married Orlando Davis and subsequently had three children with him. I have not done much research on Orlando, as he is not a direct ancestor. However, with a relatively unusual name, I am able to use it to find his wife, my third great-grandmother. In the 1840 Federal Census, I find Orlando Davis in Sherburne, Chenango County, New York. The numbers indicate that the household included one young man between the ages of 10-15 and one young man between the ages of 15-20 (likely two of their three sons). There is a man between the ages of 40-50 (Orlando Davis) and a woman between the ages of 40-50 (Fanny (Davenport) (Adsit) Davis). In the 1850 Federal Census, Fanny Davis' name finally appears in a census. Orlando Davis is 56 years old (born about 1794), a farmer with $5,000 in real estate, and born in Connecticut. His wife Fanny is recorded as 65 years old (born about 1785) and born in New York. In the image above, you see that the next family recorded is that of Chas. Davis, age 27, and his wife Mary, so they likely lived right next to each other. Charles is one of their three sons. In the 1860 Federal Census, the Orlando and Fanny are still in Sherburne, New York. Orlando is 64 years old, born in Connecticut, working as a farmer, with $6,101 noted as the value of his real estate and $1,539 noted as the value of his personal estate. This is unusual; normally you see rounded numbers in these columns, like $6,000 and $1,500. Fanny Davis is 75 years old and born in New York. I don't know who Loisa Young, age 18, is, but she did attend school within the past year. Possibly she is a granddaughter or a local girl who was helping out in their home. In 1860, I find their son Charles and his wife Mary in Milo, Yates County, New York, which is where Orlando and Fanny moved by the time of the 1870 Federal Census. Here is Charles (D?) Davis, age 47, a farmer with $12,000 in value of real estate and $4,000 (I think) in value of personal estate. His household includes his 47-year-old wife, Mary, daughter Fannie, son John, domestic servant Elizabeth Fuller, and 76-year-old O. Leander [I'm guessing Orlando] Davis, without occupation, and Fannie Davis, age 85 years old. All the ditto marks are in the column for birth place; all are noted as being born in New York. 11-year-old Fannie and 9-year-old John attended school within the year, and Charles Davis and "O Leander" Davis are noted as "Male Citizens of U.S. of 21 years of age and upwards." I found a transcription at the Yates County web page of USGenWeb of an obituary for Fanny Davis from the Yates County Chronicle. She died on April 28, 1871. Mrs. Fanny Davis, wife of Orlando Davis, died April 28th, 1871, at the residence of her son-in-law, Charles D. Davis, of the town of Milo, aged 86 years. Mrs. Davis was born in Columbia county. Her maiden name was Davenport, and she was a sister of Col. Davenport of Bath…. When about eighteen years of age Mrs. Davis moved with her father to Chemung county, and soon afterwards was married to Leonard Adsitt. Subsequently her husband died leaving five children, four sons and one daughter. She afterwards married Orlando Davis, by whom she had three sons, Chas. D., John, of Hammondsport, and George, who died while young…. Interestingly, her surviving children from her first marriage to Leonard Adsit are not mentioned. Her son James Monroe Adsit died in Chicago in 1894. I could likely find out more about her if I did additional research on her other children. Orlando Davis, age 85, appears in the 1880 Mortality Schedule as dying in Milo, N.Y. of Old Age. He had lived there for 15 years. I love using Google Maps. 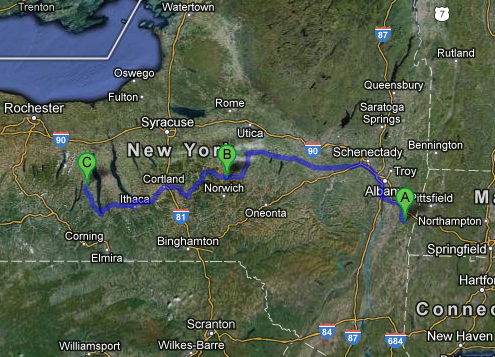 The following map shows where in New York State Fanny (Davenport) (Adsit) Davis lived during her lifetime. Elizabeth, don't you wish that the census records before 1850 included all household names? I have some brick walls I'd likely be able to break thorugh if they did! It's great that you were able to find your 3x-great grandmother via her husband's unusual name. As for Google Earth/maps, they're both amazing technologically and Orwellian-creepy. I was able to find pictures of all kinds of stuff with it, including the building where my grandfather's deli once stood. Karen, yes, there are SO many brick walls I could break through if earlier census records included all household names. And yes, it is fun, yet creepy to find a current image of a house that you have in a photograph from 40-50-60 or more years ago!